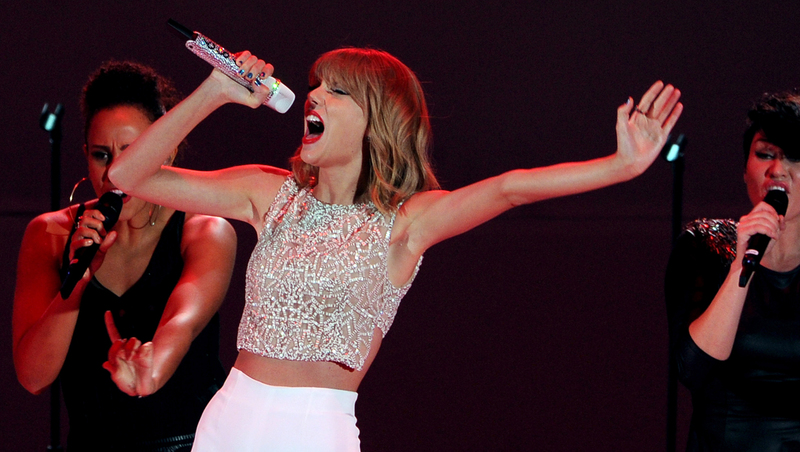 Want to hear Taylor Swift's new album, or any of the pop star's albums for that matter? Well, you won't in find them on Spotify. The 24-year-old singer has yet to make her new release, "1989," available on the music streaming site. She did the same thing with her 2012 set, "Red," but later gave permission for it to appear on Spotify. Now a search for "Taylor Swift" on Spotify only turns up "Safe and Sound," ft. The Civil Wars -- a song from "The Hunger Games" soundtrack. Swift's "Red" album was a major success, becoming the fastest-selling album in over a decade after selling 1.21 million copies in its first week. Those are big numbers by today's standards. Billboard reported in September that album sales had hit another record low. Meanwhile, her "1989" album, released last week, is on track to debut at No. 1 this week. Swift previously opened up about the relationship between artists and streaming, explaining in a Wall Street Journal op-ed in July, "Piracy, file sharing and streaming have shrunk the numbers of paid album sales drastically, and every artist has handled this blow differently. It's my opinion that music should not be free, and my prediction is that individual artists and their labels will someday decide what an album's price point is. I hope they don't underestimate themselves or undervalue their art." Spotify, for one, hopes to convince Swift to rethink her decision, writing in a blog post Monday: "We love Taylor Swift, and our more than 40 million users love her even more -- nearly 16 million of them have played her songs in the last 30 days, and she's on over 19 million playlists." Spotify also elaborated on how it pays music artists for streams: "We hope she'll change her mind and join us in building a new music economy that works for everyone. We believe fans should be able to listen to music wherever and whenever they want, and that artists have an absolute right to be paid for their work and protected from piracy. That's why we pay nearly 70% of our revenue back to the music community." The post ended with a plea: "PS - Taylor, we were both young when we first saw you, but now there's more than 40 million of us who want you to stay, stay, stay. It's a love story, baby, just say, Yes." According to Spotify, "Every time somebody listens to a song on Spotify it generates payments, but Spotify does not calculate royalties based upon a fixed 'per play' rate." Some artists have taken issue with Spotify's payment system. Go here for more on how Spotify pays artists.